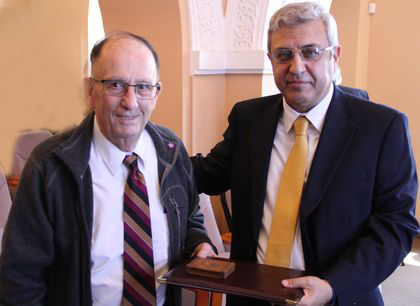 On April 7, at 12:00, at the Matenadaran's main building took place an event dedicated to the jubilee of Professor Emeritus of the Hebrew University of Jerusalem, Honorable Doctor of the Armenian National Academy of Sciences Michael Stone. Head of the Department of Study and Translation of Ancient Originals of the Matenadaran, Doctor of Philology Gohar Muradyan, presented the participants the invaluable contribution of Michael Stone into the development in Armenian Studies. Michael Stone was highly appreciated by Professor of Historical Sciences, Chief depositary Dr. Gevorg Ter-Vardanyan, Professor Abraham Terian (US), Matenadaran’s Head of the Department of Restoration Gayane Eliazyan. Vahan Ter-Ghevondyan, Director of Matenadaran, bestowed the “Matenadaran” Commemorative Medal upon Michael Stone for contribution in Armenian Studies and on occasion of his 80th birthday. Professor Michael Stone is a renowned Armenologist, founded the Department of Armenian Studies and the Department of Religious Studies in the Hebrew University of Jerusalem. He also founded and led the Association Internationale des Etudes Arméniennes – the International Association of Armenian Studies. He is the author of many valuable Armenian studies. His research interests include the study of early Hebrew and Christian Philology and source studies, especially the study of Old Testament and Apocryphal Texts.